Library users can select their preferred method of receiving notifications. This video provides an overview of the options. The following table will help you decide your preferred method of receiving notifications. Please note that notifications may not be available in all delivery methods and you will receive only one notification. You can decide which notification you want to receive by your preferred method. For example, you may like receiving Hold Pickup notification via text message, but prefer courtesy notices to come via email. You decide! And we will want you through the process, in order. Hold Pickups – notification that an item you placed on hold is ready for pickup at your library. Hold Cancellations – notification that a hold you previously placed has been cancelled. Overdues & Billing – notices that indicate you have items overdue and billing notices for outstanding fines and material not returned. Courtesy Notices – a reminder two days before your materials are due. Auto Renewals – If your library participates in auto renewals, you will be notified when materials are automatically renewed. The notification will also indicate which items could not be renewed . All notifications can be delivered via email, and some are only available via email, so verify that you have an accurate email address associated with your library account. Enter your phone number for receiving the messages and provide a label for the phone. Check all notices you wish to receive. NOTE: Manual messages and General announcements indicate message sent directly to you from the library (e.g. You forgot your umbrella at the Circ Desk) or general announcements that go out to all (e.g. Water pipe break – sorry the library is temporarily closed). Text messages notifications are run first, so if you select text messaging for any of the notification types listed, you will receive those notifications via text message. First check if your library participates in automated phone message notifications. Ask a library staff member for help. They can enter your preference of phone notification in your library account record. When you receive the phone call, your called ID will say “Local Library” from a toll-free number. Phone notification is provided by an automated system and not a human. The pre-recorded call will try to reach your hone number and leave a message, or try calling up to three times if a message cannot be left. Monday – Friday 10:30 a.m. – 7:30 p.m.
Saturday – Sunday 11:00 a.m. – 6:00 p.m. If you have an email address associated with your library account, and you have not requested Text or Automated Phone notifications, you will receive all notifications via Email. This is the preferred method of delivery, as it provides the most coverage in terms of notices. 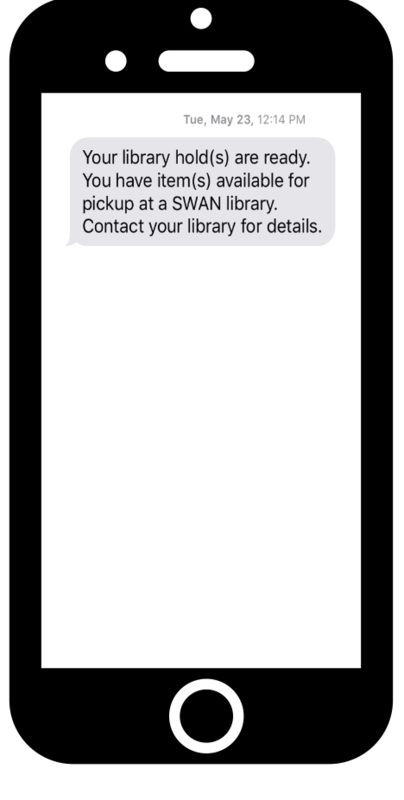 We recommend allowing any email from *.swanlibraries.net to be accepted by your mail system. This will ensure that your email notices aren’t sent to your junk folder. Ask a library staff member for help. Once your email address is entered, you can modify it through “My Account” settings in the library catalog. Watch this video to learn how. Also, email notices are also available in Spanish or Polish. Ask a library staff member to set your preferred language, if other than English. These print notices are also available in Spanish or Polish. Ask a library staff member to set your preferred language, if other than English. Ask a library staff member for help updating your notification preferences and to lean more about notification options. If you have a valid email address on record, overdue and billing notices will be sent via email to expedite delivery. Print notices are only set to patrons with no other means of notification. Please be advised that mail is often delayed in delivery, which may result in you having to pay more in overdue fines. We recommend signing up for other notifications to receive timely announcements.